Erika, Shannon and Chip debate the finer points of mixed martial arts and wonder aloud what happens when you have an episode without a discernable “A” plot. Grab a Zima and sit back! 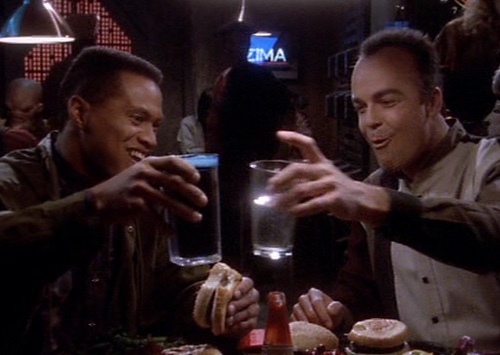 The best thing to come out of TKO was the name “The Mutai.” This eventually became the name of the Babylon 5 Fan Club’s no-holds barred, un-moderated message board. “Take it to the Mutai!” was the cry in the moderated board, whenever the discussion got too heated, and that’s where the combatants posts would be sent! I had no idea that was a thing. I love it. The two non-related plots didn’t go great together, but I like to think that the writers wanted to represent Ivanova’s inner emotions and that’s why Martian Fight Club went here. So that’s my head canon, even if the execution wasn’t great. Good to know this is lowest point for the season! It definitely wasn’t Sinclair’s lowest. Wow. I was shocked when I heard you guys were dreading TKO. Not because of the Walker Smith plot, of course. That was silly and badly written. But the Ivonova stuff is POWERFUL. It moved me very deeply. Her breakdown at the end felt very real to me. And I have absolutely no issue whatsoever with a purely character-based episode. Too often, Star Trek TNG inserted a dull “threat-of-the-week” plot to character episodes because they felt they had to. I’ll agree that the end of the season is not the right time for this, but on VHS and DVD, this was always in the middle of the season. Anyway, I know I’m coming in years late, but loving the podcast.